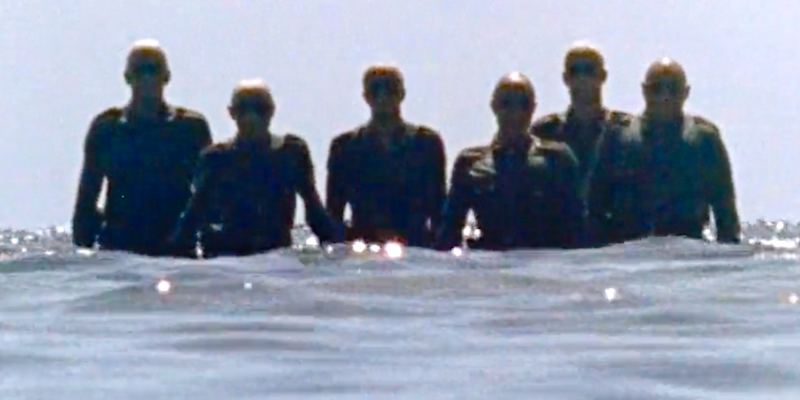 Sort-of-zombie SS super soldiers rise from the ocean depths to terrorise shipwrecked holidaymakers in an enjoyable low-budget schlocker. This review was written 38 years too late. ANY film that opens with black and white footage of Nazis and an ominous voiceover intoning about super soldier experiments and SS brigades that “no one knew what became of them” is off to a flyer in my book. 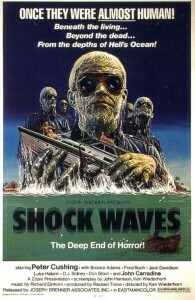 Part of the micro zombie Nazi genre, “Shock Waves” is one of the earlier films to address the idea of Europe’s most hated coming back to life. 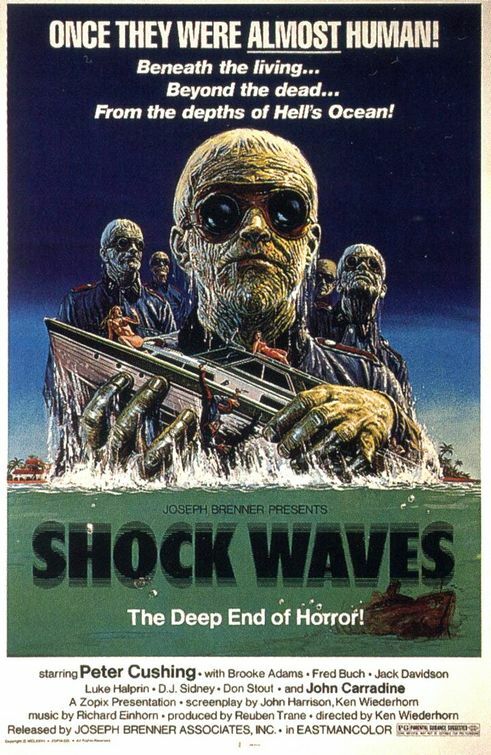 Horror veteran John Carradine skippers a barely seaworthy cruiser in the Bahamas that includes holidaymakers Brooke Adams in a bikini, a James Caan lookalike, and a few other zombie-fodder characters not worth mentioning here. A strange sunset triggers supernatural goings-on and soon their ship is crippled by a mysterious wreck, the captain’s vanished and they all row to the safety of an apparently deserted island. We couldn’t afford James Caan. Or Jared Martin. They meet Peter Cushing living alone in an abandoned hotel. He’s an old Nazi who sank the wreck after the war, burying the Nazi super soldiers it was carrying. But now, for no apparent reason, the soldiers are back. He urges the holidaymakers to escape, but do they heed his words? Do they shite. Gore-hounds, forget about it. There’s barely a drop of blood to be seen here. 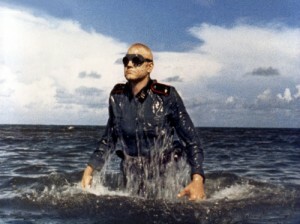 The super soldiers favour drowning to biting, tearing and eating, and spend most of their time in water slowly submerging or emerging. Ayran-blond, their goggled-eyed faces ridged and weathered after decades locked in a hulk, they look like a union between Andy Warhol and David Bowie’s Thin White Duke. But what’s lacking in claret is made up, partially, in atmosphere. A handful of shots possess a creepy, unsettling feel, and the underwater photography is rather effective. The same can’t be said for the story, cast or editing, but you can just about forgive that if you’re a B-movie aficionado. There’s no explanation for the sudden return of these undead soldiers, and Peter Cushing’s ten minutes of exposition screen time don’t convince. He and Carradine have the only screen presence; while the cutting is clumsy, both from a continuity perspective and story as characters die but no one seems to be that upset or even aware, probably due to the poor assembly of scenes. 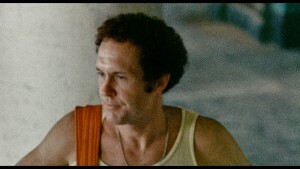 Still, director Ken Wiederhorn gives his film just enough to make it watchable. Just.